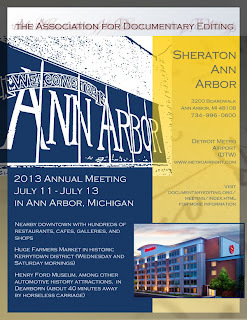 This year, the Association for Documentary Editing (ADE) is holding its 35th Annual Meeting in Ann Arbor, Michigan, July 11-13, 2013. For those interested, the Program Committee welcomes submissions for presentations or posters on all aspects of documentary editing and textual scholarship, including but not limited to editorial practice, theory, varieties of texts, collaboration, uses of edited documents in K-12 curricula, and publication. To propose a paper or poster, send an abstract of no more than 250 words to the chair of the Program Committee at mcclur@princeton.edu no later than February 1, 2013. Please include a brief c.v. or biographical note and your address, email, and phone number. Through its annual meeting, the ADE promotes cooperative networking and the exchange of ideas among editors who employ critical thinking and technical skills to present original texts to diverse audiences in a variety of formats. In addition to the Annual Meeting, there will be workshops and training from July 7-11, including the Institute for Editing Historical Documents, otherwise known as "Camp Edit." 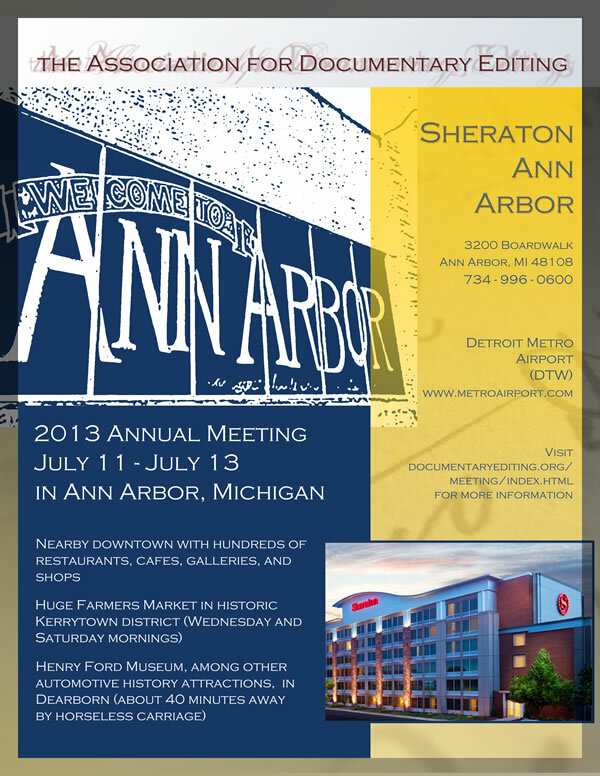 For more information, please visit the ADE Annual Meeting website.